If you follow the Daily Sentinel you know there have been numerous letters in support of re-designating the Colorado National Monument a national park and a few against. Here at GVRCNP we spend many long hours and late nights reviewing a wealth of studies regarding national parks, their rules and regulations, and impacts on environment, quality of life and economy as well as talking to people and businesses who live in areas with national parks. The positive benefits those studies and interviews reveal have helped fuel our own passion to accomplish something that truly puts our community first. We are always appreciative of those who take a moment to learn the facts and equally grateful for the opportunity to address the myths sometimes put out there by those who have not yet explored the facts. We encourage anyone with questions to contact us through our website’s “ask a question” feature or directly at gvrcnp@gmail.com. Letters to local papers are another great way to show your support. We love the chance to keep the dialogue open and going strong! Thank you for your support. 1. MYTH: Creating a national park could tighten air quality restrictions. FACT: The Colorado National Monument is designated as a class 2 area under the Clean Air Act. Re-designation would not trigger changes to the monument’s air quality class, nor does it qualify to be considered a more strict class one area. Legislation for a national park would confirm the re-designation to a national park would not trigger a change to a more strict class 1 area. Despite myths to the contrary, no industries including farmers would be impacted due to a change to park status. 2. MYTH: Creating a national park could impact water rights. FACT: There are no inherent water sources on the Colorado National Monument and no water rights would be impacted by park status. 3. MYTH: The Grand Valley would be over-run with tourists. FACT: Re-designation to a national park would help draw foreign and domestic bus tours which currently fly into Grand Valley Regional Airport then immediately leave for nearby national parks. Foreign visitors typically spend more than domestic visitors. It’s estimated the loss of their business costs the Grand Valley hundreds of thousands of dollars per year. With national park status it’s estimated visitor numbers would rise a moderate 10 percent in the next decade. Visitation by locals, typically mirrors valley growth. It’s estimated local visitation will rise 2 to 4 percent a year regardless of monument or park status. Currently, visitation and organized tours to the Colorado National Monument are at historic lows. Tour group bus numbers peaked at 500 in 1991 and have since fallen to 125 in 2012. General visitation numbers are also down from that period. Park officials estimate it would take decades to re-build to the numbers seen in the early 1990s. 4. MYTH: Creating a national park could impact current or future industries. FACT: National monuments and parks are operated under the same rules and regulations, and any future impacts would be the same regardless of title. Numerous parks and monuments are surrounded by industries like oil and gas. Some drilling operations even happen within national parks and monuments themselves. A local example is Canyonlands of the Ancients, which hosts significant drilling and grazing. No grazing or natural resource extraction happens within the Colorado National Monument and none would be impacted as a national park. The CNM view shed and NEPA regulations have had no past impact on Grand Valley or surrounding area industry (as evidenced by ample industry within the valley and by the many communication towers positioned within the national monument itself). As the National Park Service operates monuments and parks under the same set of rules and regulations the NPS response to any new industry would be exactly the same regardless of our canyons’ status as a national monument or national park. 5. MYTH: A national park would impact access for Glade Park residents and their visitors. FACT: Federally adjudicated access for Glade Park residents and Glade Park visitors will remain the same as a national park and would be included as a requirement in any future legislation to re-designate the monument to a national park. 6. MYTH: Creating a national park would mean new restrictions and regulations. Bike riders and nearby home owners could be negatively impacted. FACT: National parks and monuments operate under the very same rules, regulations and status. The only thing that would change is the name. National Park status would not trigger any new rules for bike riders or nearby home owners, nor does NPS have any jurisdiction outside of park borders. 7. MYTH: Creating a national park would not bring any new tourists. FACT: Black Canyon of the Gunnison National Park and Great Sand Dunes National Park report a steady increase in new foreign tourists, who on average spend more than domestic tourists. They also note new increases in the domestic tour groups which target only national parks. Black Canyon of the Gunnison NP attracted 192,570 visitors in 2011 (31,000 more than 2008) and 173,777 in 2012 (up 14,000+ from 2008). Great Sand Dunes NP fared even better attracting 254,000+ visitors in 2011 and 276,000+ in 2012. Becoming a national park means immediate inclusion in global and domestic travel magazines, books, articles, tours and promotions dealing with national parks. National park status also means instant inclusion on Rand McNally maps highlighting national parks. Both regions surrounding the Black Canyon of the Gunnison NP and Great Sand Dunes NP report increased hotel tax and sales and use tax revenues. The same revenues are currently and notably down in Mesa County, Palisade, Grand Junction, and Fruita and Mesa County’s unemployment rate stands at 9.5 percent. Both GSDNP and BCGNP are situated in more remote locations while the Colorado National Monument lies within close proximity to a major interstate. 8. MYTH: Creating a national park would impact local quality of life. FACT: Although Rocky Mountain National Park attracts 3 million tourists a year, the number one attraction to the adjoining town of Estes Park is not RMNP! Detailed studies by Summit Economics found the number one attraction to Rocky Mountain National Park is the remote, relaxing and peaceful get away the town provides to visitors. Residents and visitors alike say it’s specifically the area’s high quality of life that draws them. Studies of other towns located in close proximity to national parks also show quality of life issues remain the same or improve due to an increase in the tax base. Tourism remains one of the cleanest industries in the world because visitors don’t use the schools, public safety services or most infrastructure but their dollars greatly benefit all three. 9. MYTH: Visitors might trash our national monument. FACT: Delta and Montrose County residents feared the same with re-designation of the Black Canyon of the Gunnison to a national park, instead a local study determined it was locals and not visitors who were the primary source of litter. Increased funds from park visitor fees now pay to clean up littered areas. 10. 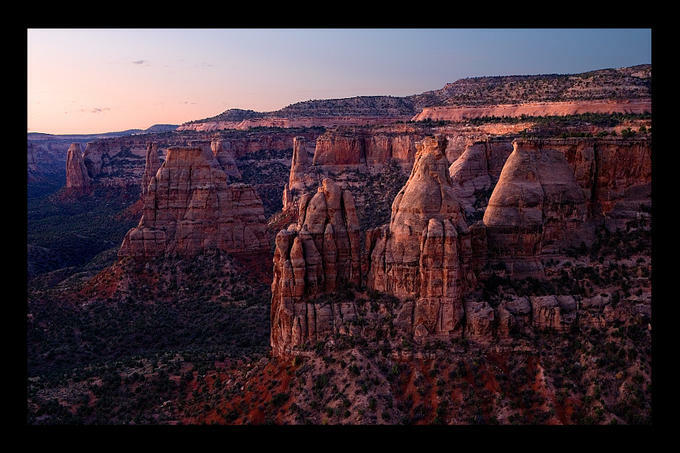 MYTH: The Colorado National Monument should be turned back over to the state of Colorado or Mesa County. FACT: According to Colorado.Gov: “Through the Louisiana Purchase in 1803 the United States acquired a vast area which included what is now most of eastern Colorado. By the Treaty of Hidalgo in 1848, Mexico ceded to the United States most of that part of Colorado not acquired by the Louisiana Purchase. In 1850, the Federal Government purchased Texas’ claims in Colorado, and the present boundaries of Colorado were established. Colorado was originally part of the Nebraska, Utah, Kansas, and New Mexico Territories. In 1859 a provisional territorial government was formed, called the Territory of Jefferson. In 1861 Congress created the Territory of Colorado.” [information from http://www.colorado.gov/dpa/doit/archives/history/histfaqs.htm ] The Colorado National Monument and much of Mesa County has been owned, funded and maintained by U.S. taxpayers and visitors who pay fees to enjoy these historic public lands for well over one hundred years. Current Federal lands have never been owned by the state of Colorado or Mesa County. Learn more about Colorado history from www.colorado.gov. 11. MYTH: Increased R.V. traffic would endanger bike riders on the monument. FACT: R.V.s and tour buses have been motoring over the monument’s historic 26 mile road for decades. The vast majority of motorists visit in the midst of our heated summer months. Those who bike our monument regularly (many for decades) have found no issue with summer tourists for one simple reason. Regular cyclists try to arrive at the monument in the early dawn hours to avoid the searing afternoon heat. Knowing this is the case, the GJ Visitors and Convention Bureau directs tour groups to hold off on visiting the monument till late morning. Most bikers see very few if any tour vans. In fact, regular monument bikers are far more likely to tell you they have noticed a sizable decrease in visitors and they’re right. Tour bus numbers to the CNM peaked at 500 in 1991 and have declined ever since. Fewer than 125 tour vans visited the monument last year. Additionally, while there have long been contingents of private R.V.s traveling the nation, most tour groups have traded in those large buses of old, for smaller more efficient vehicles to host smaller and more intimate tour groups of 15 to 25 people. 12. MYTH: National park status could force the government to “condemn” nearby homes and use eminent domain to confiscate the property and expand the national park. FACT: Any legislation to re-designate the Colorado National Monument to a national park will stipulate that its current borders will remain exactly the same as a national park. Because it takes an act of Congress to create a national park it also takes an act of Congress to change it’s status or borders. Therefore, the NPS cannot purchase or acquire (much less condemn) any land outside of the national park boundaries established by Congress. Land bordering national parks may be donated to the NPS but the NPS is not allowed to purchase or acquire them in any way other than donation. Some homes and businesses do exist within national parks as inholdings. There are no inholdings within the current Colorado National Monument borders nor would there be if it is established as a national park. Some are also propagating myths about a “buffer zone”. There is currently no buffer zone around the Monument due to the existence of 191 private landowners who abut the Monument. BLM land also borders the Monument. If the Monument becomes a National Park, draft legislation will confirm a buffer zone will not be possible due to the current direct abutment to private land and the commitment of remaining within existing boundaries. Private land will remain private land. The impact on homes next to the Colorado National Monument is far more likely to be a very positive one should it be re-designated as a national park. It is possible those with properties in close proximity to the national park may experience higher valuations. Studies by Headwaters Economics show properties near protected open space, particularly national parks, maintain a higher value. The closer to protected open space the properties are, the more enhanced the value. 13. MYTH: Changing the name of the monument is a better option. FACT: Simply changing the monument’s name would not convince tour groups which only target national parks to visit the Colorado National Monument, only park status can do that. It would not elevate the park’s status or the valley’s profile nationally and internationally at no cost to locals, nor would it merit inclusion in any book, article, tour or promotion highlighting the nation’s national parks. It would not allow for the monument’s inclusion on Rand McNally maps highlighting national parks. Further, John Otto and our community set out in 1907 with the primary goal of designating our magnificent canyons as a national park, a name change does nothing to see that historic community goal through to success. 14. MYTH: Park supporters had to “stretch” the truth about the Colorado National Monument’s inherent features to help it meet stringent National Park Service qualifications to become a national park. FACT: Nothing could be further from the truth. Either a monument meets the strict NPS guidelines to become a national park or it doesn’t. The Colorado National Monument is among a rare few left in the nation which meets and often exceeds the criterion for national park status. It’s uniquely formed hanging canyons, ancient Native American ruins (some dating past 10-thousand BC), artifacts and petroglyphs, fossils and rare dinosaur and Jurassic turtle footprints, thousand year old Pinyon trees, intact Juniper woodlands, petrified sand dunes and exposed geography of the ages all combine to tell a fascinating story of the world, time and mankind. It is a first rate national monument and would in fact be a 1st tier national park on par or surpassing many existing parks on a variety of levels. National park status does not rely on size but our Colorado National Monument is larger than at least 14 current national parks (See our FAQs section for a list). 15. MYTH: The re-designation effort is all about money and is not an “altruistic” effort. FACT: Missouri born John Otto first wandered into our canyons in 1906 and put down stakes. He said then, “I found this place and it feels like the heart of the world to me. I’m going to stay here and build trails and promote this place, because it should be a national park.” True to his word, while many others of the time used their shovels, picks and powder to blast their way to gold and fortune, Otto, camped out in our canyons and labored unpaid to carve out trails visitors still follow today. He circulated the first petition for a national park in 1907, doggedly writing letters to federal officials, hounding the Daily Sentinel’s publisher and convincing every businessman and leader of the time to sign his petition. Our canyons were on the way to park status when a Congressional slowdown threatened the entire process. Otto’s leadership and the unflagging community support that followed convinced President William Howard Taft to intervene and use his powers under the Antiquities Act to designate our canyons a national monument via a presidential proclamation. Otto settled for monument status but spent the rest of his life writing letters to reach his dream of a national park. No one, who knows his history can say John Otto’s dedication to making our canyons a national park was anything but altruistic. Today’s organizers of Grand Valley Region Citizens for a National Park admittedly do not spend our days, building trails through Otto’s “heart of the world” or for that matter, pitching our tents among its rough and towering red rock canyons . It is far more likely you will find one or some of us camped out behind a computer, researching facts, writing letter after letter, on the phone with experts on air quality, economics, residents and leaders of other communities with national parks, and local folks or businessmen who want to know more about status change. Our unpaid labor isn’t the sweaty, physical kind whose fruits grow before your eyes and allow a strict measure of progress. We Tweet, Facebook, cobble together web pages and stand before organizations and people who at least so far have been open minded to and excited about the possibilities. We can only judge our progress by the light that flashes in someone’s eyes who smiles and says, “Yes!” and the growing number of businesses and residents who add their name to our community petition. Some of us rode horses along the canyon’s once undeveloped base (before subdivisions moved in), now many of us ride bikes along her curvy, breathtaking rim, none nursing dreams of cycling grandeur, just pushing ourselves…because we can. LIke you, we hike its red rock trails, including those Otto carved out day after day and year after dedicated year. The Monument is a grand part of what makes this valley feel like “home” even to the those among us who are not originally from here. Some of us are just plain excited our community has a very real chance to elevate this deserving place that has been so special and sacred throughout our lives to a national park. That national park status will attract foreign and domestic tour companies which currently bypass us for national parks and cost our valley hundreds of thousands of dollars in estimated losses also cannot be denied. Nor should it be. If sharing the “heart of the world” with the rest of the world means a sustained and moderate economic boost for current and future generations we believe that seems like a good and positive thing. In essence, this is about finally accomplishing a community dream born in 1907, it is about a modern day community following the footsteps of those who came before us to accomplish something good for generations to come , to enhance the economy and most of all to elevate the monument to a status it has long deserved along side America’s other national parks.